Recently I’ve been craving Serbian Bean Soup (Pasulj) which has been an all-time favorite in my family, but funny enough no one ever bothered to make it from scratch – but we would have lunch at our favorite Yugoslavian eatery (now defunct). So I started to dig for recipes. Some, I found, use sausage, some use potatoes, some use tomato paste, some use non of these, some require bacon or smoked ribs, others will even use canned beans (yuck). The solution presented itself while talking to a friend whose family is half Croatian. „Bean Stew?“ she said. „I need to ask my mum to make a huge pot of this soon.“ And so I sort of pried the recipe from her (she was watching her mother prepare it and handing the details to me in an online chat). Start by quick-soaking the beans. Once drained. fill them into your soup pot (I use a heavy cast-iron dutch oven with a heavy lid) and add carrots, onion, garlic, stock and bacon. Let simmer slowly until beans are soft, but not mushy – depending on choice and age of your beans this may take between two and four hours. (This is where I let everything sit on the kitchen counter overnight and proceed the next day). Remove the bacon and dice. Return to the pot. In a small saucepan, melt the butter, add the flour and stir until you have a roux, add the paprika, stir again, and stir in a ladlefull of the soup liquid. Transfer the paprika paste to the soup pot, stir, bring to a boil and let simmer for 10 minutes. Taste for salt and pepper. 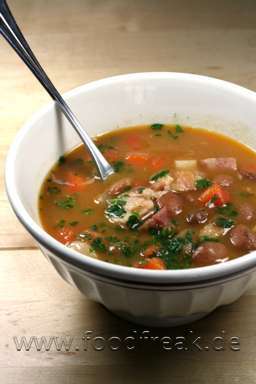 If you like it, add chopped parsley when serving the soup. Simple, down-to-earth, totally unfancy and non-fine-dining. And perfect cold weather fare for those cold dark winter nights we’re still fighting here up in the North (north of 53° latitude, that is).